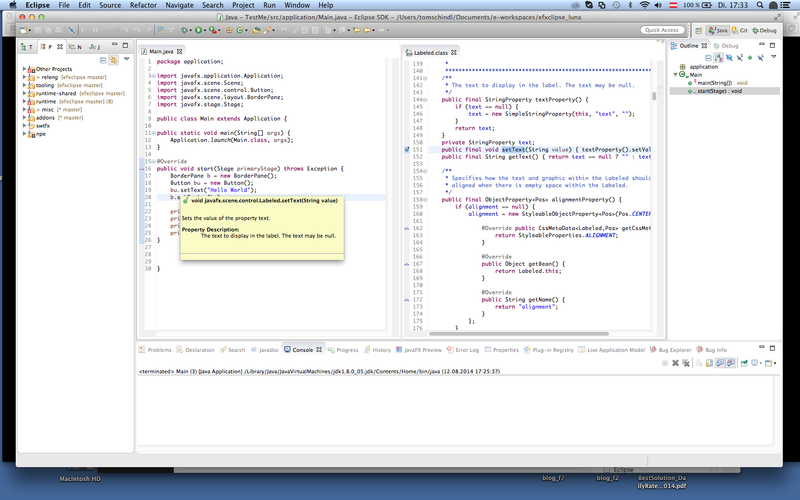 JDT in Luna added an extension point e(fx)clipse makes use of to contribute the location of the JavaFX source code when the JRE System Library is initialized. The nice effect this has for developers is that they e.g. can debug through JavaFX source code without any manual configuration. Unfortunately adding the source produces a problem one does not notice when only the HTML-JavaDoc is attached to the JRE. The JavaFX team is lazy and does not JavaDoc all of the 3 Property-Methods (get*/set*/*Property) but does it only once and the JavaDoc-Tool has an UNDOCUMENTED switch to procude HTML-JavaDoc for all 2 of them. Now that Eclipse has the source it would not have shown JavaDoc for the methods because it didn’t know about this secret JavaDoc-Feature. We contributed the needed magic to JDT and the JDT-Team accept and polished our contribution. 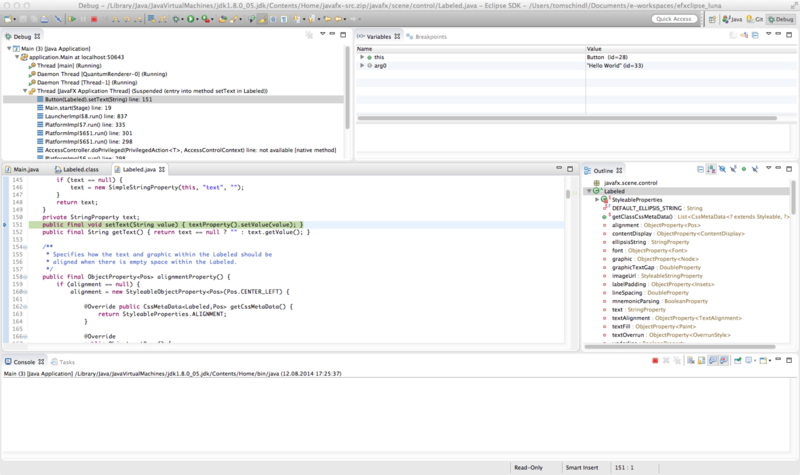 If you look closely to the right you notice that there’s no JavaDoc on all those methods so without the fix in JDT you would have seen fairly no JavaDoc JavaFX-Property accessors.